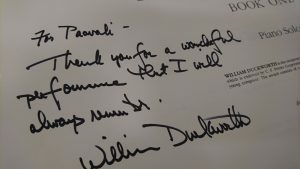 While preparing for a performance of some music by William Duckworth (1943–2012) in New York this coming weekend, I want to record some thoughts about the music and relate some experiences I had with the composer. I’ll be playing a selection extracted from Duckworth’s concert-length piano cycle The Time Curve Preludes as part of a recital I am performing at the Frick Collection on October 8, 2017. The other pieces on the program are Debussy’s Études and Beethoven’s Appassionata sonata. I knew Bill personally and worked with him on several occasions at Bucknell University, where he taught from the 70s until not long before he passed away. I began regular visits to Bucknell in 2001 and, during the following years, often visited his courses. We also collaborated in the Gallery Series, an annual offering of concerts that Bill curated dedicated to new music. I performed quite a few programs in the Gallery Series, mostly European avant-garde classics–Boulez, Messiaen, and the like–as well as works I had commissioned from Finnish composers. Bill always welcomed my programming ideas and was enthusiastic about presenting the music I offered … well, almost always: on one occasion I really wanted to include a Beethoven sonata and argued that Beethoven had been avant-garde in his day, but Bill drew the line there and so no Beethoven was played on the Gallery Series. It was the right decision. At Bucknell, Bill taught a great course called Jazz, Rock, and Avant-garde. It always attracted an enthusiastic and diverse group of students who had different musical interests and came from varying backgrounds. To go to that class with a score of the Boulez Third Sonata and explore it together with, for example, engineering students who loved Zappa but had little notion of Bach, was fascinating. Some great questions arose during those sessions, but, above all, it was genuinely wonderful to spend time with young people eager to take in anything new. Jazz, Rock, and Avant-garde–man, talk about a broad and meaningful musical database for a course! But that expansiveness was also very much “Bill” and, in fact, I think some of that resonates within the richness and spirit of The Time Curve Preludes. This is a cycle of 24 preludes, 24 little musical universes that share a common conviction while offering a huge variety of subtle references to a wide spectrum across the 20th century Euro–American musical scene. Near the end of Bill’s life, I had the opportunity to study The Time Curve Preludes with him and perform the work in his presence at an event marking his retirement from Bucknell. The entire cycle (composed in 1979) consists of two books, each with 12 preludes played non-stop. There is a definitive minimalist feel to the cycle, although really only one or two of the preludes are repetitive in the true minimalist sense. (Bill has been cited as the originator of “postminimalism.”) Many of the preludes are meditative and many transmit borderline pop-style rhythmicity. Some are eerie, some markedly avant-garde, one is a clear homage to Messiaen; the cycle has the sound of “downtown” and, remarkably as well, that of “uptown.” And yet all of it sounds like Duckworth–possibly because of a particular kind of modality he applied throughout. I guess Bill had figured out something discovered by other stylistically memorable composers including Ravel, Mozart, Schoenberg, and a few others: if you want your music to have a distinctive sound, there’s probably no better way to accomplish this than by finding or creating your own kind of harmony. It was a great pleasure to work with Bill on the TCPs. He was very particular and had a clear vision for each of the preludes (BTW, don’t tell them, but I hate working with composers who don’t have a good idea of how their music should sound…). And this next was really fun: he was completely willing to share the inspiration from which each arose (Debussy, the Fibonacci series, Bartók, bluegrass, Messiaen, etc.). He came to our work together with open ears and a readiness to hear the preludes in new ways. The quote at the top of this post is from a note Bill sent to me after having listened to a recording of a performance I’d given of the TPCs. What can I say? He was a clever and very classy guy! So, why chess? A particular aspect of the TCPs are what Bill called “drones.” They are resonances caused by the sympathetic vibrations of open strings in the instrument. Before playing each prelude, the pianist sets specifically designated weights on a few bass keys, thus lifting their dampers and leaving them to freely vibrate through the piece. The vibrations create a subtle background harmony, a kind of buzz or hum, different for each prelude. The same effect could be accomplished by using the sostenuto pedal of the grand piano (the middle pedal), but Bill preferred using weights for two reasons. Reorganizing the weights provides a calming, ritual-like moment of silence between the movements, and, secondly, he enjoyed the visual effect which to him resembled the the moving of chess pieces but on a piano keyboard. THE TIME CURVE PRELUDES were written between June 1977 and June 1978 on a Fellowship from the National Endowment for the Arts. They reflect my continued interest in rhythmic structures as a means of formal organization, modal and synthetic scales, and the establishment of musical “centers of gravity” through drones. The use of rhythmic devices to control various proportional aspects of musical time is not new to the twentieth century. Medieval theorists saw a direct relationship between proportions that control the universe (1:1, 2:1, 3:2, and 4:3) and the musical harmonies generated by the proportions (the union, octave, perfect fifth, and perfect fourth). In this century such composers as John Cage, Olivier Messiaen, and Conlon Nancarrow have explored rhythmic proportions as a structural component of their music. This renewed interest in rhythmic structures, along with the serial techniques of Schoenberg and the neoclassicism of Stravinsky, were attempts to give new form and meaning to music at a time when the decaying tonal system made the traditional forms based on this system increasingly invalid. In the first half of this century, serialism appeared to offer the best solutions to the problem of form. But serialism was too concerned with pitch organization and the 1950s and 60s saw the self-limiting aspect of serialism counterbalanced by chance operations. From the perspective of 1979, both approaches appear to have lost considerable ground. For my own work, I am coming increasingly to believe that rhythmic structures based on duration offer great potential as a means of formal organization. In these preludes, I have systematically explored several types of rhythmic organization. First, extensive use is made of the Fibonacci series, a proportional number series in which any number is the sum of the previous two numbers. This series is best expressed in whole numbers as 1, 1, 2, 3, 5, 8, 13, 21, 34, 55, 89, … I have used the proportions in ten of the preludes to organize such aspects as time lengths, section lengths, and phrase lengths. Second, I have developed additive and reductive rhythmic systems which are used singularly and in combination in fourteen of the preludes. These systems, which constantly add and/or subtract fixed increments of time, provide formal unity and consistency while simultaneously insuring rhythmic variety and asymmetry. I would hasten to add at this point that I do not consider these preludes mathematical pieces. Once the formal rhythmic processes were established for each prelude, I tried to allow my musical intuition to dominate the compositional process. This duality between intellect and emotion, and the constant striving to keep the two in some kind of artistic balance, seems to me to define the creative process. Most Western music achieves musical interest by contrast. Themes, key centers, timbres, and harmonies are juxtaposed against each other for maximum effect. In the majority of these preludes, however, I have replaced this type of contrast with a development based on internal unity. Each prelude concentrates on revealing, developing, and sustaining one basic idea. This is, essentially, an Eastern concept of organization. On another level, the entire set of twenty-four preludes may be considered monothematic. The first prelude is a source prelude from which melodic and rhythmic ideas are constantly drawn and transformed. The prelude is, itself, a transformation of an earlier work of mine, The Last Nocturn. The melody of the source prelude appears, in some form, in seven of the preludes, including the sustained pitches of No. 5 and the prolonged chords of No. 23. On yet another level, this source melody is slowly revealed, from prelude to prelude, by the primary and secondary drones, over the space of one hour. These slowly moving centers of gravity produced by holding keys down with rubber wedges or weights, give the source melody, and thus the source prelude, an essentially timeless quality. Posted in Composers, Concerts, New Music, Program Notes. Bookmark the permalink.